Kelli McCabe is a no-nonsense detective with a tough exterior. Only a select few know her as a loyal, loving friend. To a fault, she is committed to her family, friends and her job. As a surgeon, Nora Whitmore is used to being in control. The hospital is her life. There is little else. Respected by her colleagues but ridiculed by the residents, Nora takes what she needs and keeps everyone else at arm’s length, creating unexpected enemies. Tragedy brings them together in a clash of personalities. 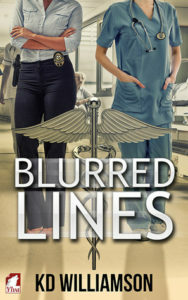 As the chaos around them continues, they find the lines between them blurring. A friendship forms, understanding grows, and attraction soon follows. Together, they may conquer their own misgivings, but will the outside forces keep them apart? This was an excellent start to the series. Two closed off women, Kelli and Nora, have a visceral reaction when they meet, and for once, it isn’t lust at first sight. Kelli is a cop who’s been shot in the line of duty and she is extremely bored sitting through her recovery. Nora is the attending surgeon at the hospital where Kelli is recovering. Because of Nora’s past, she is alone, eschewing friendships and any romantic involvement. It has earned her the moniker of Ice Queen, or several variants, and her desire to maintain distance and professionalism make her the easy target of Kelli’s mischievous way of alleviating her boredom. The result of their encounters leave Nora feeling flustered and alive in a way she hasn’t ever felt before, while Kelli finds her interest piqued and fascinated by Nora’s reactions. And so begins a slow dance of trust, of letting down barriers, and of attraction. This book kept me turning page after page as I urged these two women to open up to each other. Nora’s professional problems, brought on by an unfortunate intersection of work and private life, become the basis for a continued relationship between the two women as Kelli endeavors to help Nora out. Part of me feels that the relationship took too long to move forward, and the other part thinks it was perfect, and Kelli inexorably pushed Nora’s boundaries, making her realize that she had those feelings and it was okay, because she could trust Kelli with them. Kelli’s family was a rich addition and the subplots of Kelli’s work and family relationships echoed the impersonal relationships that Nora had. At the end, the devious plot against Nora is foiled, and Kelli and Nora find a way to fight their fears about getting closer. A very enjoyable read. KD (aka Minerva/Rizzleslvr72) is a Southerner and a former nomad, taking up residence in the Mid-West, east coast, and New Orleans over the years. She is also a Hurricane Katrina survivor. Displaced to the mountains of North Carolina, she found her way back to New Orleans, where she lives with her partner of ten years and the strangest dogs and cats in existence.